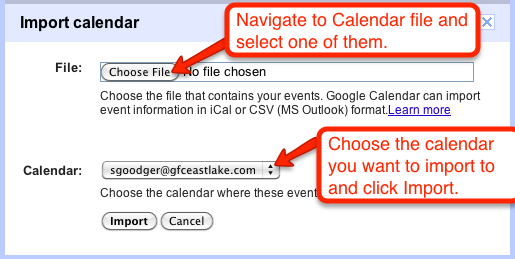 View your Calendars within the OLD instance of Google Apps. Click on Settings in the upper right corner of your screen and select Calendar Settings. 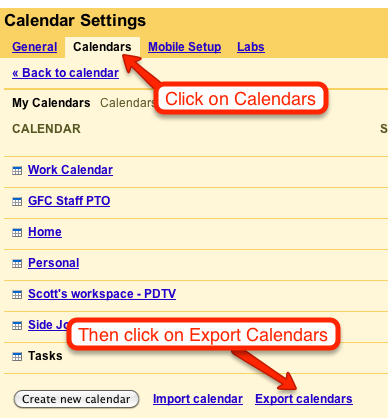 Click on Calendars and then click on Export Calendars. This will download a .zip file to your computer. (Pay attention to the location that this file downloads to. Mine downloaded to my “Downloads” folder. Yours MAY download to a different location. Find the file you just downloaded and open it. This will reveal your exported calendars. Pay attention to the loaction of these files. Open your Calendars in the NEW instance of Google Apps. Repeat step 2 to open your Calendar Settings. You will now need to re-create your calendars so that you can import to them. Click on Create New Calendar. Repeat for each calendar that you exported. After creating your new calendars, it’s time to import the old calendars to the new ones. Click on Import Calendars. Click on Browse. Navigate to the calendar files from Step 4 above. Select one. Select the Calendar you would like to import to. Click Enter. Repeat this process for each calendar you would like to import. 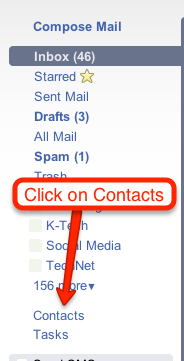 The user should login to their OLD Google Apps Email and click on contacts in the left-hand column. Click Export in the upper right corner of the Contacts screen. Clicking Export will download a file to your computer called google.csv. Make note of its location. Open the email of the NEW Google Apps instance and click Contacts as you did in step 1 above. Click on Import in the upper right corner of your screen (same area as Export from Step 2). Navigate to and select your google.csv file that you exported in Step 4. After selecting the file, click Import.